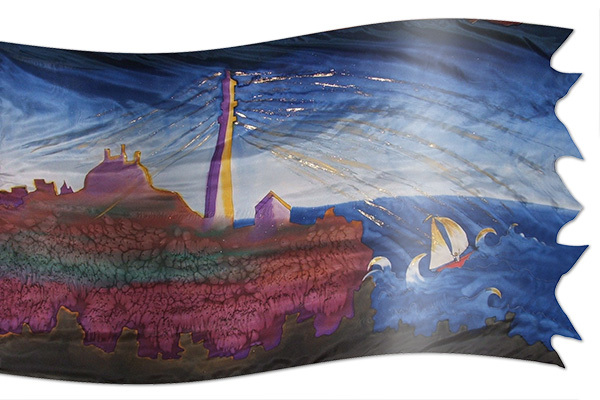 This banner has been intricately painted to show a tiny sail boat caught in a rough sea. The waves and sharp rocks seem to be pressing in upon this small vessel as it is tossed to and fro upon the water. But in the centre of the banner stands a tall lighthouse, beaming out a light with a message of hope of a safe landing. This banner poignantly represents our assurance and hope in the safety of salvation and the rescuing power of the cross. In the midst of life’s trials and tribulations, we can declare with confidence that "from the Lord comes deliverance" (Psalm 3:8). In Matthew 12: 21 we are told that in the Lord’s name will the “nations put their hope”. Jesus is also described as the “hope of Israel” in Jeremiah 14:8;17:13; and Acts 28:20. We are told that “hope does not disappoint us” because of the love of God and testimony of the Holy Spirit in our lives (Romans 5:5). Hebrews 6:19 describes a Christian’s hope as “an anchor for the soul, firm and secure”. Black: (Escape from) Satan, Death, Mourning, Sin, Famine (Lamentations 4:8; Jeremiah 8:21; Revelation 6:5).